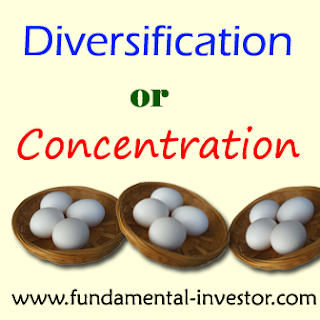 Fundamental Investor: Diversified vs Concentrated Portfolio !!! Diversified vs Concentrated Portfolio !!! Portfolio Structuring is key to Wealth Creation. Which Portfolio works better? Is it Diversified Portfolio or Concentrated Portfolio? What are the advantages and risks associated with either? Read on..
2016 was an interesting year for all of us. We together learnt and shared a lot of fundamentals in the Investing World. I would like to begin this year by wishing you all a Wonderful New Year 2017. I hope this year turns out to be yet another year of learning and wonderful experiences for all of us. "Which is better? Diversified Investment? Or Concentrated Investment?" My close friend and investor recently disclosed to me, that his friend invests Rs "X" every week on a New Stock. One New Stock every Week. He doesn't repeat stocks and he doesn't check the screen after the investment. In the last three years or so, he must be having more than 150 companies he has invested in. In some he has gained. In some he has lost. But he continues to invest in this way. How many of us invest like this person? How many of us have more than 150 - 200 companies in our portfolio? When was the last time we ever tried to track the performance of all the companies we HOLD in our portfolio? If we don't understand most of our companies in our portfolio, but hold a lot, this is called "Unknown Diversified Investing". In this kind of investing, we would never know why we are invested in most of our companies and would never know when to exit a particular company in our portfolio. We would never be able to explain the rationale behind investments mainly because after a few months, reasons change, conditions change. Companies evolve and their returns vary over a period of time. Lets stop here for a moment. Let us introspect whether we fall in above category or not. Now that we have seen the effects of Unknown Diversified Investing, let us look at what is Intelligent Diversification. In our economy, all sectors would not do well at all points of time. Sometimes, Information Technology would do well due to Currency Fluctuations and Order wins. Sometimes, Manufacturing would do well due to high Demand and conducive economic conditions. Sometimes, Finance would be in flavor while some other times Real Estate would be the talk of the town. Pharma would do well and suddenly Consumption Stocks would surge. Our Stock Market is extremely dynamic. Traders and Investors rotate and churn their money from sector to sector based on the performance and overall growth prospects of various sectors & companies. Hence, you will see some sectors dipping while some other sectors booming up. To avoid serious losses, investors Diversify their Investments into various sectors which they understand. In this way, one sector's notional profit would neutralize another sector's notional loss and hence, hopefully, capital would not degrade. Most of the Mutual Fund houses follow this principle of Diversification so that the portfolio gets a steady growth without capital degradation over a longer period of time. But again, when we have a large number of companies in our portfolio, it again becomes difficult to track their performance and prospects. I have taken the first few companies which are popular and having high market cap and normally part of any diversified portfolio. The last few companies are companies which are not very big but growing well and have been in news for various reasons. This is how our portfolio would look today. If you notice, the returns in the above example portfolio is 12% in the last one year. The Nifty has moved from 7458 to 8362 in the last one year. This is around 12% gains from overall market. In the above example, some companies gave negative returns and some outperformed. However, the final gain is still 12%. This means that capital was not lost in this exercise with the above companies. With a decent Diversified Portfolio, we might get steady returns which might be on the lower side. The returns basically depend on how all companies really performed in our portfolio. There is a famous saying - Never Put all your eggs into one basket. Contradictory right? Confusing? Assume that you had invested all your money into HCC in January 2016. All eggs in one basket. You would have doubled your capital from Rs 1 Lakh to Rs 2 Lakh. However, what would have happened if you had invested your capital into INDIGO in the last one year. All eggs in one basket. You would have had Rs 80400 with you. What if you needed some money when your Concentrated Portfolio was in RED. Will you be able to sell or liquidate? Having all investments in one company puts you in a risky position. Whether you are in profit or loss, you would spend hours everyday in front of the computer screen waiting for the loss to become profit or the fear of losing profits. Exit point becomes very difficult when all eggs are in one basket. Let us say that we have researched a company very well. We have done all homework and all our calculations are perfect as far as the future is concerned. We put all our money on that company. What are the risks? What if the company takes more time to perform? Maybe 2-3 years. What if the macros do not support during the current year? What if some order doesn't materialize? Basically there is a risk of money getting stuck mainly when we need it. We might remain in notional loss for a couple of years. Sometimes, for a month, we will be in profit. For next quarter, we might be in loss before swinging back into profits. What if better opportunities come up when we are in notional loss? When we put our money into one company, we need to have a Long Term Mindset. We need to allow the company to manifest through all our calculations. We need to stay with the company while it grows. It might take a long time, but if our calculations and homework is good, we will eventually make a lot of money. We need to closely track the performance of the company every quarter and ensure that it is on track. This is the commitment we need to make before concentrating our money on one company. We also need to ensure that we do not get distracted by other new stories so that we can focus on the one invested. There are lots of investors who have been really part of multi-bagger companies by investing a big sum of money and staying with the company as it grows. If a multi-bagger is part of a diversified portfolio, the gains get subdued. Like in above example, HCC and INDIGO were part of Diversified Portfolio which gave 12%. However, concentrating in HCC would have given 100% returns and same amount in INDIGO would have been in Notional Loss. So, what do we do? Can we take best of both worlds? According to me, the best combination is to Concentrate Capital in a small Diversified Portfolio of companies. The number of companies in portfolio can vary from 3 to 10 based on the individual. Of course, this is just my personal opinion and has worked for me. If we can find 5 companies from 5 sectors which are bound to outperform in the next 3 to 5 years and invest 20% of our capital into each, we can end up making a lot of money. But with Concentration comes great Responsibility. We need to ensure that our 5 companies are on track and perform as per our calculations in the long term. We should also have the guts to accept our mistakes and move on, if the company doesn't perform as per our expectations. We should also have the Patience to wait until the company really gets the value from investors in long run. Always remember that Compounding is a Powerful Tool in the Investing World. 5 companies which compound well can make your portfolio huge in a matter of 5 years. Another investor friend of mine shared with me a unique portfolio structuring which I found quite interesting. He has 3 companies in Core Portfolio which is around 80% of his Capital. Remaining 20% - Invests in trades, positional investing, small bets, penny stocks, high beta stories etc. Whatever profits he earns from the "remaining 20%", he pumps it back to the 3 top companies. He also shared with me that he never ever touches his Core Portfolio of 3 stocks. Many investors, out of greed for quick money, play with core portfolio instead of keeping it untouched. We end up allocating small portion for high conviction stocks and heavy portion for bets. Because of this, we miss the real opportunity to make money in stocks which perform and lose by taking huge bets. Today, I have touched upon various structures just so that we can put on our thinking cap. Finally, its upon us to decide how to structure our portfolios. Let us understand ourselves well and decide our own strategy. Let us spend good time in analyzing future prospects of companies which we understand from sectors which will do well in times to come. Remember - THE BEST STRATEGY IS THE ONE WHICH WORKS, FOR US. Let us make this decision wisely and make good money. HAPPY NEW YEAR 2017 !!! write up of great practical value from you FI bro. Am planning to realign my pf. Your write up provided required clarity. Thanks bro. Good article for a common retail investor! Thanks for sharing with us your very valuable and important knowledge & experience on diversification.